NBA season preview: Who will challenge the Golden State Warriors? 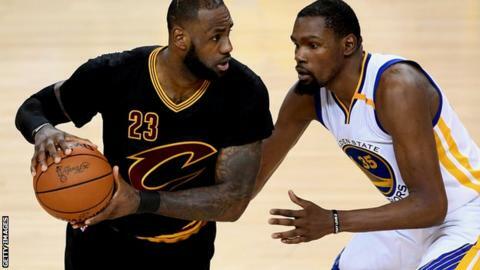 LeBron James (left) and Kevin Durant in last season's NBA finals. Will it be four Cleveland-Golden State finals in a row? Having a "big three" on the roster used to be the big ticket for a team to make a run at the NBA championship, but increasingly this is becoming a bare minimum. Having three all-star quality players has helped the Boston Celtics, the Miami Heat and others to titles in recent years but now, in an effort to beat reigning champions the Golden State Warriors and their "big four", teams have used the off-season to trade for talent like never before. And there is perhaps as much talent to trade as there has ever been. The race to be the Most Valuable Player (MVP) last season was so strong the nominees did not even include legendary Cleveland Cavaliers player LeBron James, who is widely regarded as the world's best player. Nor did it include the previous reigning two-time MVP Steph Curry, who plays for the champions. Golden State already had a "big four", with Curry, Kevin Durant and sharpshooter Klay Thompson combining for an average of 72.7 points per game, fed by Draymond Green's 10.2 assists per game. Although Cleveland have lost one of the league's best finishers, Kyrie Irving, to Boston, they got Isaiah Thomas back in the trade. They have also picked up a couple of star veterans in Dwyane Wade and Derrick Rose. As Wade is now 35, and Rose's initially stellar career has been blighted by several knee surgeries, the two may share the fourth-man spotlight. Add that to LeBron's near triple-double every time he plays and Kevin Love's versatile 19 points and 11.1 rebounds, and Cleveland might not miss Irving as much as they might have feared. So, as the new season gets under way on Tuesday, could we be entering a new golden generation in the NBA, or will the rise of the super-teams see some fans suffer? Britain's Luol Deng, a forward with the LA Lakers, is returning for his 14th season. Deng says it is difficult to compare eras but thinks there is definitely something golden about this generation. "I can't speak for the years of Michael Jordan or the people before. But I've never seen so many good players," he said. "The league has changed to include so many superstars and that's why I really believe an expansion of the league will happen one day, or more teams." Not everyone is quite so optimistic. Jordan, now owner of the Charlotte Hornets, believes the hectic summer trades have seen the talent condensing into fewer super-teams - leaving the rest struggling to compete. "You're starting to see a little bit of it now, where the stars are starting to gang up and go on one team," Jordan - a celebrity cigar smoker - said in an interview for Cigar Aficionado magazine. "I think it's going to hurt the overall aspect of the league from a competitive standpoint. You're going to have one or two teams that are going to be great and another 28 teams that are going to be garbage. Or they're going to have a tough time surviving in the business environment." That "ganging up" is a direct response to how good the Warriors are at the moment. They have two former MVPs, a host of all-stars, two titles in the past three years and secured a league record number of victories in the 2015-16 regular season. "I think every team is trying to catch them up. Honestly, they are the best team right now," said Deng. But, after all the trading places, who are their main challengers? Six-time champion Michael Jordan - receiving the Presidential Medal of Freedom from Chicago Bulls fan Barack Obama - has concerns about the NBA. Golden State's only real rivals in this era of dominance have been the Cavaliers, who have been the Warriors' opponents in all three finals series and won in 2016, thanks in no small part to LeBron. But they too have had to recruit in order to compete - and, crucially, LeBron is still there. Thunder, who last season had to rely on MVP Russell Westbrook and his record-breaking triple-double season [averaging double figures in three categories - in his case points, assists and rebounds], have added all-stars Carmelo Anthony from the New York Knicks and Paul George from the Indiana Pacers. The Houston Rockets have also strengthened - adding Chris Paul, possibly the league's best playmaker. He joins James Harden, aka 'The Beard', runner-up in last year's MVP voting. In search of an 18th championship, the Boston Celtics have also added all-star talent in Gordon Hayward from Utah and Kyrie Irving, who left the Cavaliers in the Isaiah Thomas trade after scoring 25 points a game for Cleveland last season. Gregg Popovich's San Antonio Spurs will always be contenders, and it will be interesting to see how the Minnesota Timberwolves' addition of Jimmy Butler will fare as he joins up with the young talent of Andrew Wiggins and Karl-Anthony Towns. The rise of the super-teams? When Boston and the LA Lakers were dominating in the 1980s, only five different teams appeared in the 10 NBA finals of that decade. Although Jordan's Chicago Bulls won six of the next 10 finals, there were nine different finalists in that decade. In the past 10 years, 10 teams have made repeat trips to the NBA finals, including repeat finals involving Golden State and Cleveland for the past three years, and San Antonio v Miami for the two years before that. LA Lakers fans will be hoping Ball can bring a little of Magic Johnson's showtime back to the team, because they have struggled in recent years. Ball, who already has his own shoe brand, has a lot to live up to after his dad said he was better than Steph Curry, LeBron and Russell Westbrook. The second NBA draft pick of the summer won multiple awards in his one season of college basketball. And early pre-season performances from the 19-year-old point guard suggest he is good. The Philadelphia 76ers have struggled in recent years, and have been given the number one draft pick [which traditionally goes to one of the worst eight teams in the league] twice in a row. The 2016 first choice out of college, Ben Simmons, missed the rest of that season with injury. This year the 76ers have drafted in Fultz, who will link up with 7ft Cameroonian centre Joel Embiid, who is as charismatic as he is talented. Could this be the first time that 76ers fans have reasons to be cheerful? Fultz, who started playing at the age of three and entered this year's draft after just one year of college aged 19, says he models his game on Westbrook. For years, British interest in the league has centred on Deng - and, briefly, Portland centre Joel Freeland - but he now has company in the form of Anunoby, who was born in London. However, after moving away from the UK at an early age, Anunoby now considers Jefferson City in Missouri his hometown. He was drafted by the Toronto Raptors and is a forward who is more at home on the defensive end. While LeBron leads the pack trying to defeat the Warriors on the court, he has been defending them in a different sense during the off-season. He described Donald Trump as a "bum" after the US president withdrew the Golden State Warriors' traditional champions invitation to the White House, in response to Curry's statement that he did not want to attend. The fight for the right to next year's White House invite, should one be forthcoming, looks set to be a little more open than in previous years, but the Warriors are still setting a Golden standard and at best it is probably a few-horse race rather than two-horse. If the era of "big three" players appears over for better or worse, maybe it has been replaced by that of the big three or four teams, unless we get another Warriors title in 2018 and, all of a sudden, in the land of giants everyone else appears small.